Classroom training using presentations have been around forever, and while you may be interested in other options, many still use the classic method of a PowerPoint deck in a training room. Why limit yourself to just one option when you have a cornucopia of training methods to choose from? Treat yourself! Use a mix of methods, carefully selected to create one, cohesive learning experience. This blended learning. It’s more than just a method for delivering content to learners. Blended learning is an approach to designing effective learning experiences. To create a really effective blended learning experience, you need to know how to select the right methods and bring your content to life. We’ll look at how to create dynamic, interactive, and engaging blended learning experiences using the same tool that you’ve always used – that’s right, PowerPoint. Get people going early with easy-to-create eLearning content made using simple, but powerful functions. Make classroom sessions more interactive by responding to your audience’s needs with create-one, use-many PowerPoint decks. Find out how to give people the tools and resources they need afterwards with hand-outs, job aids, and infographics. Create just-in-time microlearning videos for when learners need content most. 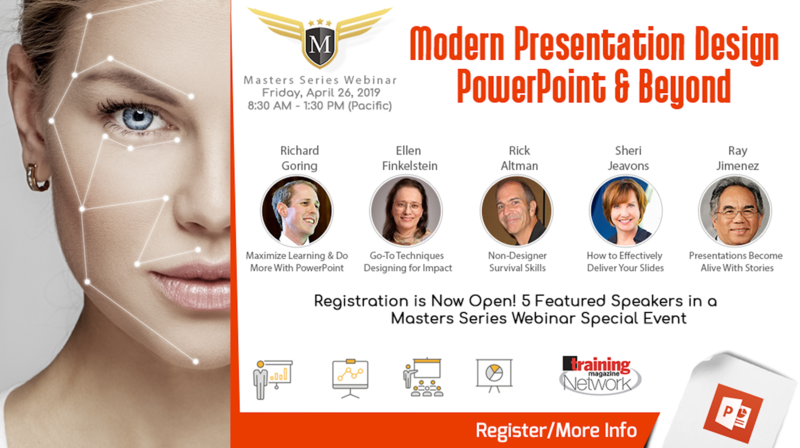 *The Modern Blended Learning Experience to Maximize Learning Transfer is the Keynote session to The Masters Series - For more information or to register for The full Masters Series event - Modern Presentation Design - PowerPoint & Beyond on Friday, April 26, 2019, please click here or on the below image.